Thousands of people die every year from some form of drug overdose. In the U.S. alone, approximately 64,000 lives were lost to overdose in the year 2016, as reported by the National Institute on Drug Abuse. Because the U.S. government does not track overdose rates for every drug, this number could be even higher. 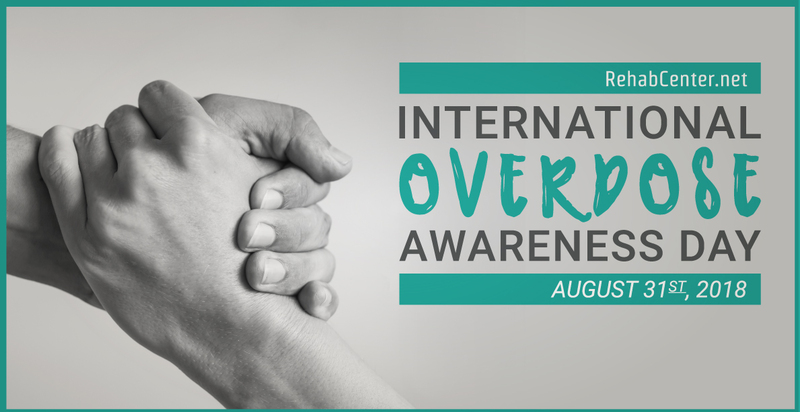 Due to such alarming rates of loss caused by substance abuse and addiction, the global community has attempted to fight back in a number of ways, including hosting an International Overdose Awareness Day on August 31 of each year. International Overdose Awareness Day is a global recognition day which serves two purposes: to bring awareness to drug overdose and to reduce stigma with drug-related death. Why is it important to bring awareness to drug overdose? While thousands of people will experience a drug-related overdose each year, not everyone is familiar with overdose symptoms. Raising awareness for this topic helps educate the public on what to look for in an overdose, signs a loved one may be abusing drugs, and how to seek help for either situation. Signs of overdose will vary depending on the drug of abuse, as different drugs will affect the body in different ways. For example, a person overdosing on a stimulant, such as amphetamines or methamphetamine (meth), could experience chest pain, seizures, paranoia, hallucinations, and high fever. A person overdosing on a depressant drug, such as opioids or benzodiazepines, may experience shallow or stopped breathing, slowed heart rate, disorientation, or inability to be roused. The goal of recognizing the signs of overdose is to help prevent as many overdose fatalities as possible. The best way to combat overdose deaths is to prevent them from happening by identifying the signs of an overdose and immediately seeking help. In some cases, overdose reversal drugs, such as naloxone (Narcan), may be administered to stop the effects of an overdose from becoming fatal. Another aim of raising awareness of drug overdose is to shed light on the far-reaching impact of overdose on the families, friends, and loved ones of those who are lost to it. The number of drug-related deaths show: negative stigma associated with substance abuse and addiction largely affects overdose. People may be ashamed to seek help for substance abuse, especially if they have been to treatment and relapsed. Negative public opinions and criticisms of those with substance use problems has affected the rate at which people seek help for these issues. International Overdose Awareness Day works to reverse this trend. Addiction stigma often starts with language. People who abuse drugs may be called emotionally harmful names, like crackhead, stoner, junkie, or addict. These names isolate the person with the problem, making them feel ashamed of their issue, even though addiction is a mental illness which reduces or eliminates a person’s ability to stop seeking and using drugs. Names then turn into judgments, which in turn result in opinions and actions, such as not helping those with addiction or substance use disorders because people believe these individuals are not deserving of help. Some people may also think addicted individuals choose to be addicted or to keep using drugs, so they are no longer worthy of grace or aid in resources. As a global community, people need to recognize the need to reduce (and eventually stop) this stigma. Addiction is a chronic disease, one which will require daily management for those who have it and are willing to work to overcome it. People with chronic physical diseases, such as cancer or diabetes, are not shamed by society, and neither should we shame those with addiction. The very first International Overdose Awareness Day was held in 2001 and hosted by the Salvation Army in St. Kelda, Melbourne, according to OverdoseDay.com. The Salvation Army has been traditionally involved with helping people from all walks of life—providing resources, financial aid, and programs—including those affected by substance abuse and addiction. In fact, this organization helps over 150,000 people every year combat addiction, offering resources for treatment, help in building social and work skills (a necessary component for managing addiction is fostering a strong, substance-free way of life), and aiding individuals in regaining their help and reconnecting them with their families. Since its inception, International Overdose Day has impacted the lives of thousands of people worldwide. Government and non-government organizations, communities, leaders, volunteers, and individuals participate in and host events to bring awareness to the tragedy of overdose. Events associated with the Day have been coordinated by the not-for-profit Penington Institute, an Australian organization, since 2012. Organizations from all over the world host events and sponsor efforts to support International Overdose Awareness Day. Events aim to provide materials to people with information about overdose, stigma, signs of a substance use disorder, and how to seek help. Those interested in participating in or hosting an event for International Awareness Day can visit OverdoseDay.com for a complete list of events held worldwide. The site also provides a number of resources, such as tips and tools for events, a spot to register the event, and a starter kit for organizers. People who are unable to host or attend events can also buy and wear a badge or wristband to show their support for overdose awareness. The drugs most likely to cause overdose are those which cause physical dependence: alcohol, benzodiazepines, barbiturates, and opioids, which include heroin. This is because a dependence causes withdrawal symptoms when a person stops or reduces drug use. Withdrawal symptoms can be so uncomfortable (some can be potentially fatal) that a person continues to use drugs in order to avoid or alleviate this symptoms. At the same time, with increased drug abuse comes increased tolerance. As a person becomes intolerant to the effects of a drug, it is harder for them to recognize when they are abusing it too much. Though there are no known safe levels for drugs of abuse, using drugs in higher doses and more frequently increases the risk of overdose as the drug builds up in the body faster than a person’s system can process it. Overdose can occur due to too much of a drug in the body at one time or through an excess over an extended period of time. The unpredictability of overdose is, perhaps, one of the scariest things about it. Some drugs can cause overdose with the first dose, especially those which are laced with other, more potent drugs. Of late, fentanyl-laced cocaine and fentanyl-laced heroin have been circulating and leading to many fatalities. Fentanyl is an opioid drug with a much greater potency than certain other opioids, so combining it with another powerful drug greatly increases its potential for causing overdose. Unfortunately, many people who abuse drugs obtain them illicitly, meaning they cannot guarantee if the drug has been tampered with and contains other substances. We can also prevent overdose by knowing the signs of addiction and aiding loved ones in seeking proper treatment before it’s too late. Signs of addiction can surface in a variety of ways, and may be behavioral, physical, or psychological. Behavioral Signs: loss of control over drug use; uncharacteristic risk-taking; neglecting responsibilities; keeping secrets from loved ones; hiding or attempting to hide drug use. Physical Signs: extreme and sudden weight loss; disruptions to sleep patterns; infections, bruises, or lesions at injection sites; bloodshot or pinpoint pupils, changes in appearance. Psychological Signs: irritability; denial of addiction or drug use; paranoia; hallucinations; development of or worsened symptoms of a mental health disorder, like anxiety or depression. People with addiction need grace and understanding, and most importantly, they need help and support from loved ones. Only with a strong support network in place, either from family and friends or within a treatment program, can a person succeed in battling addiction. Participating in International Overdose Awareness Day is one way to show this level of support. While there are many struggling with addiction and substance abuse every day, there are numerous programs throughout the United States and all over the world to help these individuals learn to manage these issues. Inpatient programs allow addicted persons to heal in a welcoming, peaceful environment surrounded by 24-hour access to medical help and to receive the best care possible in addiction treatment. Outpatient programs provide resources for those who wish to have continued care for addiction treatment after completing an intensive treatment program. No matter how great someone’s addiction issue, they have plenty of resources, and it all starts with raising awareness and making people knowledgeable of the options and help available. Learn more about overdose awareness and addiction treatment options by talking to a specialist today. I want to thank ALL OF YOU who started this event.. as well as all others…. THIS MEANS SO MUCH TO ME!!! MY SON JOSEPH FRONDUTO PASSED AWAY 01/14/2018!!!! THIS FOR ME IS ABOUT MY PRECIOUS 25-YEAR-OLD SON. AS WELL AS ALL THE MILLIONS WHO ARE BATTLING THIS AWFUL ADDICTION, FAMILIES SUFFERING, PARENTS WHO ARE NOW WITHOUT THERE CHILD/ CHILDREN .. CHILDREN WHO HAVE LOST PARENTS… THE STIGMA OF ADDICTION HAS TO STOP… WE DESERVE JUSTICE, CHANGE AND TO BE HEARD LOUD AND CLEAR!